2 years ago, I found a notice on our town email list that someone was giving away grapes which grow in her backyard. I connected with her, got 3 pounds of concord grapes, made jelly and gave her a few jars in return. Last year, for whatever reason, we didn't connect, but I made another batch from *gasp* store-bought grapes. Yesterday, I noticed that she was posting on the email list again with more grapes. I immediately called my friend, since I was stuck at work, and asked if she could pick some up for me. 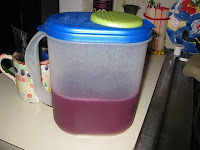 I came home to a bag full of grapes, just enough to make the 4 cups of juice required for the jelly. (Thank you!) I washed and boiled the grapes, let them drain through a cheesecloth, and put the juice in the fridge because I was too tired to make the jelly. Tonight, after everyone was asleep, I made the jelly, and had the above-mentioned boiling over incident. I still got 7 half-pint jars plus a little more which is in tupperware. But I still had a little time on my hands, and had just picked up today's farm share, so I set about to find something else to do. Hmmm. Maybe the daikon radish? Actually, I know people use daikon in cooking, but I was looking forward to making those little yellow radish pickles you get at Japanese restaurants. 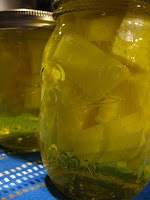 I found this recipe, and the only difference was that I processed the pickles in boiling water for 10 minutes and let them sit for 5 before I took them out. I'm so excited to try them! That hasn't happened to me yet. I have a huge pot that I use for jam, a Revere Ware stock pot I've had since I was 22 and will, hopefully, have for the rest of my life. My husband loves grape jelly and his eyes lit up when I just now told him about your grape jelly. Except for the boiling over part. I use a 6 quart pot and should really move to the 8 quart one.... The grape jelly is SO easy. And even better when the grapes are free! I planted a concord grape vine in my backyard 2 years ago but it hasn't done anything yet, but it's great that my town has people who are willing to give stuff away like that. 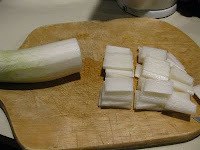 The daikon radish pickle is too salty. I'll have to find another recipe. "OK, Now You've Gone Too Far"